These burfis have the natural color of the highly priced spice in the world wide culinary market...."Saffron"........which protects against cancer, promotes memory and learning retention, increases vitality and protects against cold....so, with all these benefits, this culinary treasure has to be used, though it is quite expensive, and we must avoid artificial food colors. Recently, I made these burfis for my cousin brother's daughter's engagement, and these burfis were one among the other trousseau plates,were gobbled up in no time....... and won lot of accolades!!! Almonds / badam - 1 1/4 cups, soaked in hot water for 2-3 hours. Saffron strands soaked in warm water; 2 cups sugar measured and taken in a pan. 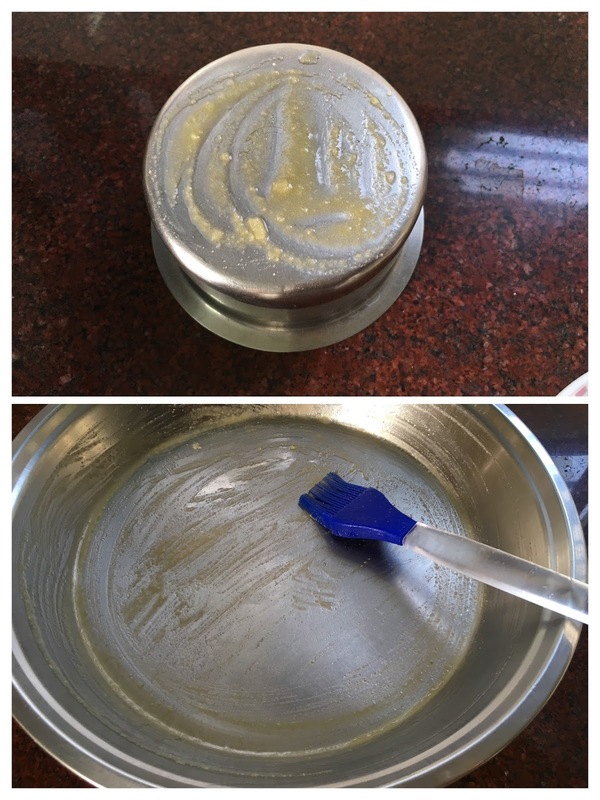 Measure 1 cup ghee and keep it handy. 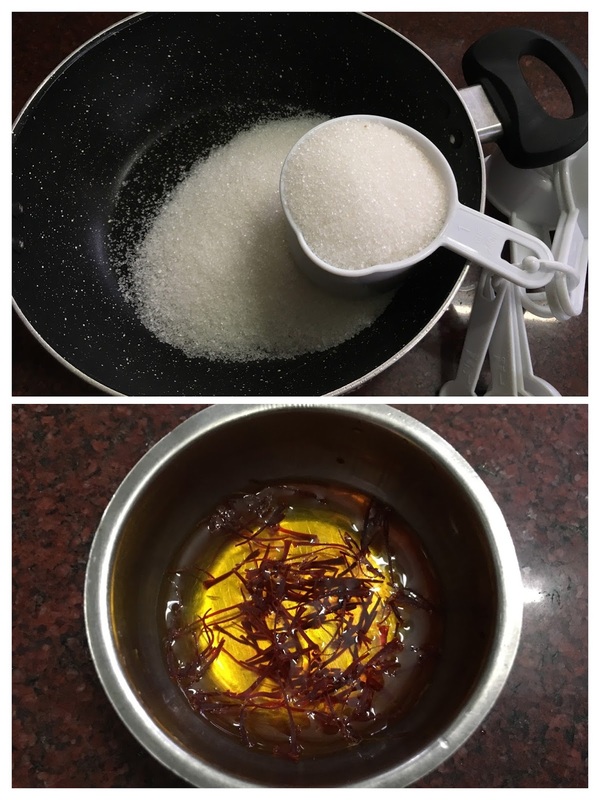 When the sugar melts fully, add the ground paste along with cardamom powder, flames always on the lowest, keep on stirring. 2 tbsps of ghee to be added now and then. Various stages of the burfi mixture shown below. 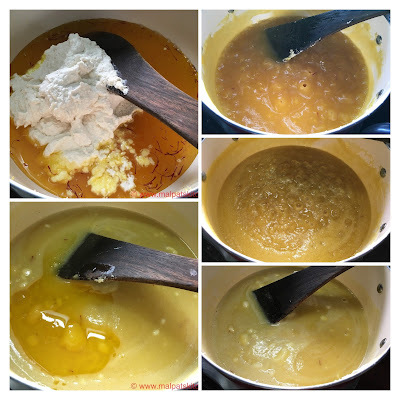 Picture below shows the various stages of the burfi, clicked once in 10-15 minutes, and the last picture on top extreme left, shows the mixture becoming a lumpy mass, leaving the sides, without sticking at the bottom, and also white froth appearing, first around the corners, and then , all over. This is the final stage...we have to be careful. 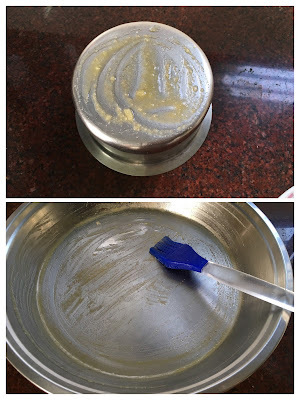 If you keep on stirring, there is a chance of the burfis becoming like bricks....so hard.....By now, little by little, one cup of ghee has been poured in. 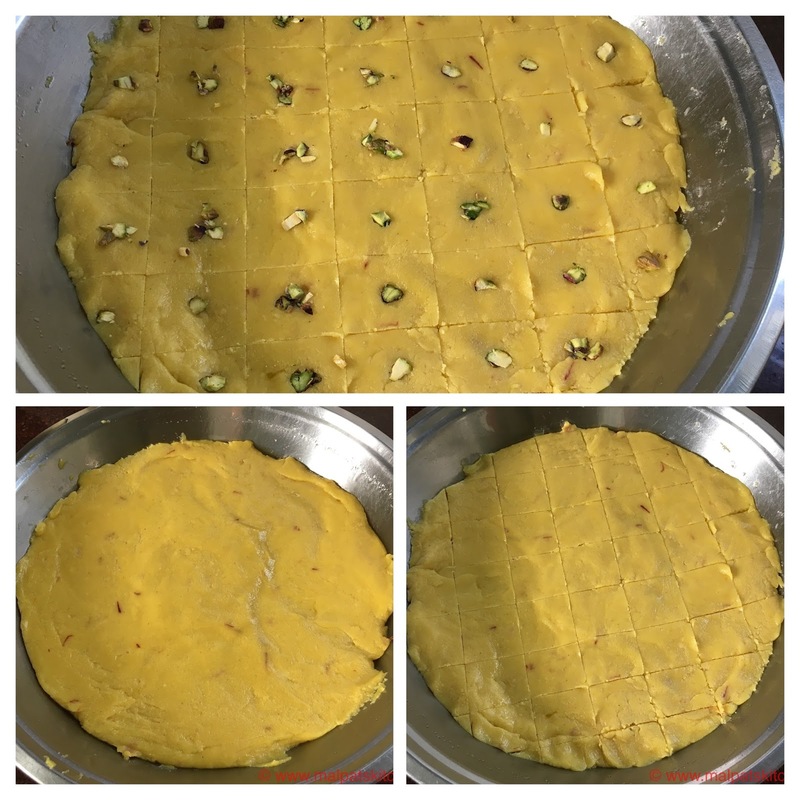 Burfi mixture poured, levelled, let to rest for 15-20 minutes, by then it would have solidified a bit, cut into desired shape, and embed pistachio pieces in the center of each burfi. Now, leave the burfi alone, forget it, and be patient!!! In the words of Sadguru Saibaba, what every human being needs in each stage of life is "Shraddha & Saburi"....that is, perseverance and patience.........in our everyday cooking also it is needed...am I right??? After they cool down, cut and remove. Corner pieces kept separately, and the full sqaure ones kept to adorn the plate. This is how they were decorated!!! * The badams can be soaked over night also, if you are planning to make it in the early morning. *Many people add milk to grind, but remember, then burfis have less shelf life and care has to be taken to refrigerate them at once. 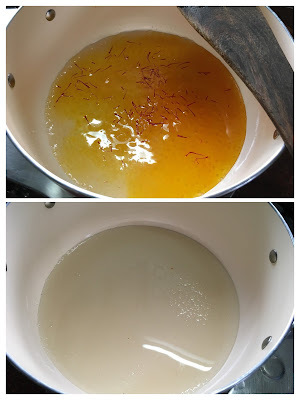 *I am always against adding artificial food colors, if you don't mind, you are welcome to add kesar (orange) color. * This is a very very mild burfi, like a katli, if you need more sweet, you can increase the sugar level. *The whole thing can be simply summarized like this: You can take any amount of badams. It is the ground paste the measurement of which counts. 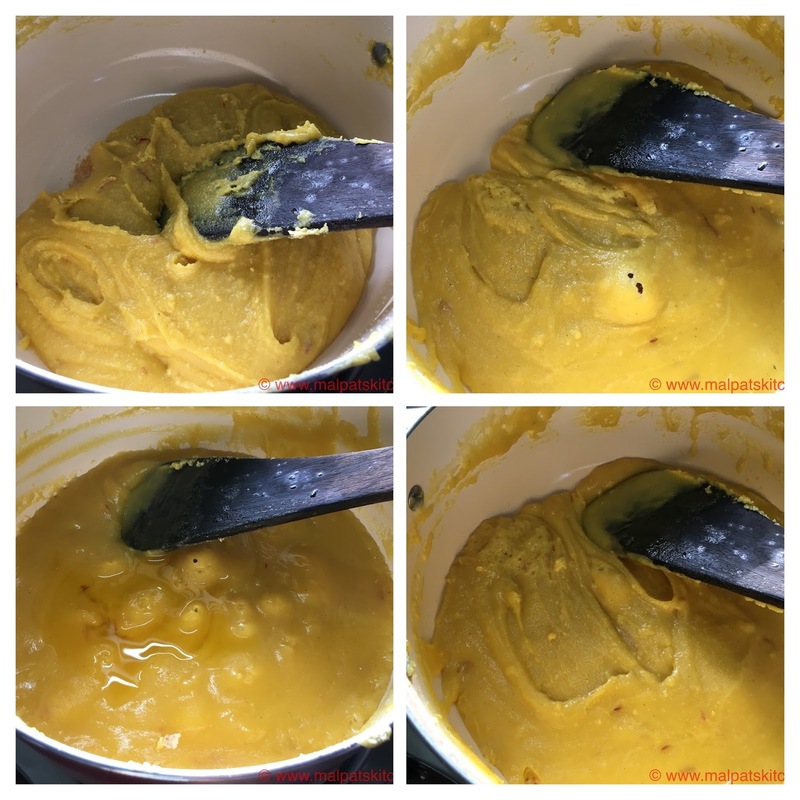 If the ground paste is 1 cup (any cup, glass, US measurement , stainless steel tumbler, or a ceramic mug), sugar is 1 cup with the same one, with which you measured the ground paste and it is 1/2 of the same measure ghee. Is it a bit confusing??? Nothing can be narrated so extensively step by step like this badam burfi. I think you can not go wrong if you follow theses steps to the T. Wow!! Needless to add, the platter is rich, resplendent-and scrumptious!! 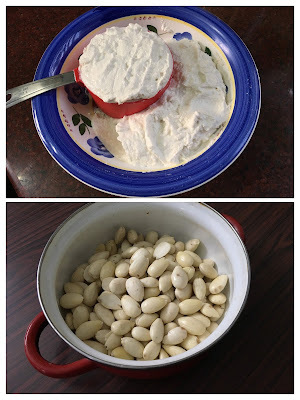 I gleefully add that I made the traditional Tamil sweet Therettipal of yours and it was a huge success and next on my list is this bountiful badam burfi Thank you. Religiously reading all your recipes.They are so Well explained. Please do post chocolate burfi recipe too if you don't mind as Some make it with cocoa and few with bournvita.